With the release of the NBNCo Strategic Review earlier this week, I’ve seen some very significant misunderstandings (and consequent angst) expressed about the inclusion of HFC into the mix of technologies intended for the NBN rollout. This post is intended to be a counterpoint to those misunderstandings. I haven’t written this post to tell you that this is the best, or the only, way to change the shape of the future version of this network. I haven’t written this because I’ve stopped believing that the best ultimate answer wherever possible is Fibre-To-The-Premises (FTTP) – because it still is. Rather, I’ve written this in the hope that, whatever view you form about the use of HFC in the NBN, at least the view you form will be far better informed than it would otherwise be. And if you hold strong views about this, I’d implore you to actually read the whole report. The scourge of “TL;DR” (‘too long; didn’t read’) is strongly in evidence here. While it is a darn big document, thats because it has a heck of a lot of really useful information in it! Anyway – please read on. Currently unused Telstra cable TV box on my wall, under the incoming copper phone line. HFC (Hybrid Fibre Coax), more commonly known as the Cable TV network – was first deployed in Australia by Telstra and Optus in the early 1990’s. While it started out as a TV transmission system, it has also become a broadband service delivery network for both of those carriers. It is quite a widespread system in a number of areas of Australia (mostly metropolitan, it is also in some regional centres). 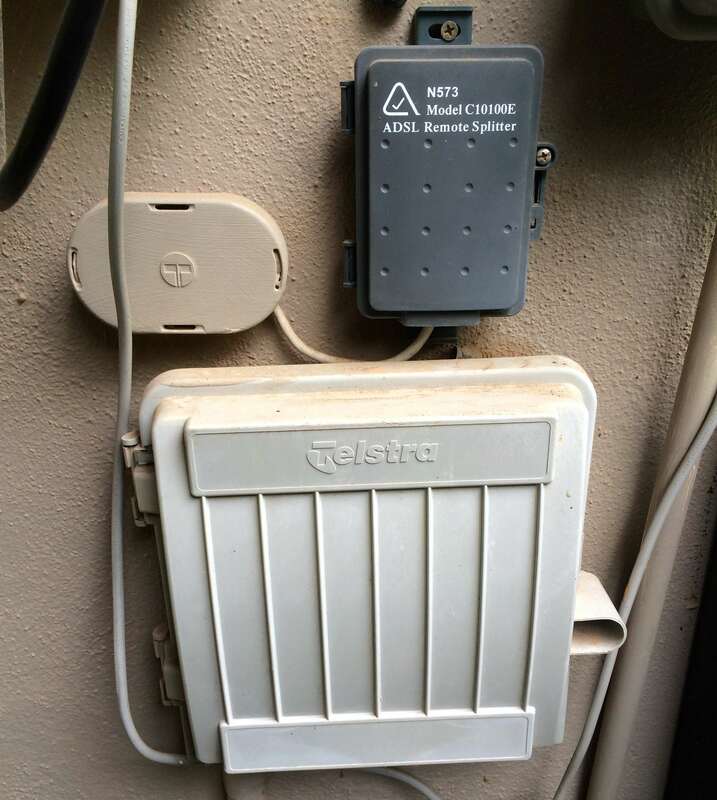 Indeed, while I use ADSL2+ for my broadband at home, my own house has a Telstra cable box on the wall as well. I’ve never used it, but it’s there. How common is it to have an HFC box on the wall of your house? Collectively, Telstra and Optus HFC networks pass ~2.7 million premises. A further ~0.7 million premises are in the geographic area bounded by the networks, but currently not passed. The prior NBN policy was to over-build these 3.4 million premises with FTTP and close down all existing use of HFC for broadband. The strategic review proposes instead to retain, expand, and deploy these HFC networks as a part of the NBN. Many people who have reacted to this news have made presumptions about what this means which are simply wrong. The right answers are in the review, but its a big document, and I’ve had the advantage of having had a few weeks to study it, ahead of its general release. The presumption some people are making is that NBNCo are proposing to pick up the existing HFC networks (as is, where is), flip them into the NBN, spend nothing extra, and just make do with that. They envisage this means that NBNCo will be delivering nothing more than whatever HFC services Telstra and Optus sell today, with an NBN badge slapped on it. This implies an investment in those areas which is far lower than even the FTTN build investments – representing an effective abandonment of those areas in terms of network quality. They aren’t alone in holding these beliefs, with these articles merely being great exemplars of that point of view. But… is this really right?? These assertions are generated from an understandable but incorrect assumption; that the NBN deployment of HFC will just be the existing HFC rollouts of Telstra and Optus, re-badged and otherwise left alone. In fact, the review proposes to take the existing Telstra and Optus HFC cable networks, and to transform them into a modern broadband network via major investment in these areas. For standalone premises in the rollout areas concerned this includes repairing all existing lead-ins that need it, building all the missing lead-ins that were never done in the original HFC rollout, and expanding the HFC rollout into all the ‘black spots’ inside those overall rollouts that were left behind when the original rollouts ceased. The deployment also includes a laundry list of network upgrades and capacity expansions to deliver high performance, low contention-ratio 100 megabit downstream rates. What about upstream data rates? Its really important that all parts of the NBN deliver high upstream rates – and this is definitely intended to happen in the NBN HFC deployment. The intended HFC upgrades will allow NBNCo to deliver high speed (30-40 megabit per second) upstream data rates in the HFC network – a dramatic contrast to typical 1-2 megabit upstream data rates in retail HFC services today. High upstream speeds are one of the critical requirements of the NBN. It is a key to providing genuine improvements to the utility of access to the Internet for all Australians. This is an outcome that I am deeply committed to seeing happen in the NBN (across all technologies). Why do it this way? Why not overbuild these areas with FTTP? Completing the rollout of coaxial lead-ins to all premises in existing HFC regions costs less, and happens much faster, than discarding this infrastructure and doing a total overbuild with FTTP. This is simply because a huge proportion of the total NBN cost, and a huge driver of the total NBN rollout time, is driven by the installation of ‘lead-ins’. The ‘lead-in’ is the piece of the network (of whatever sort) that runs between the street and the wall of your home. That ‘little’ part of the end-to-end network path is in fact a big piece – a really big piece – of the cost and time challenge. Where existing lead-ins are up to the task, then it is far more cost efficient and more sensible to use them, than it is to replace them. What sort of performance and speeds will this deliver? A key concern expressed by many is that the existing HFC exhibits poor performance during busy times, along with the presumed retention of existing tiny upload speeds (1-2 megabits per second). However, this will be a deployment where nodes will be split extensively (made smaller in terms of homes per node), in order to minimise the contention ratio on the network. The spectrum being used for the deployment will also be expanded, and modern IP capable data transmission equipment will be pushed deep into the resulting network. HFC is capable of NBN grade outcomes, providing sufficient investment is made in the infrastructure concerned. Well, the investment commitment is there (this being the key point many have missed). As a result, this is a faster and lower cost path to getting millions of premises connected than using FTTP from scratch in those areas. The rollout is way behind. We all appreciate that. This approach is a huge key to turning that around, and to bringing millions of premises up to scratch in short order. Upgrade paths beyond 100 megabits for HFC are noted in the strategic review document on page 100. However, the review is also being conservative (in my view) in framing DOCSIS 3.1 as only supporting up to 250 megabit services on HFC. I have participated in vendor briefings already in which I’ve been shown the rollout path via DOCSIS 3.1 all the way to delivering 1000 megabit data rates. These upgrade paths start to become possible once DOCSIS 3.1 equipment hits the market in the next 3-5 years. It is also important to note that coaxial cable doesn’t have the very short distance limitations that copper does, at gigabit speeds. These are much ‘fatter’ cables – in physical and in spectral terms. They are of a far higher quality than copper phone lines, and are capable of sustaining dramatically higher bandwidths. Will everyone in HFC areas get HFC based NBN services? A specific commitment is that the (standalone premises) rollout in HFC areas will generate 100% HFC coverage in those areas. The whole idea here – the whole idea of the NBN – is to have no black-spots left. This is in the review document, but its a bit hidden away. So its no wonder Adam and Renai missed it. In HFC areas, the fastest rollout will be by completing the lead-ins required and filling in gaps in the footprint with HFC. Its not totally clear from the above, but this isn’t just an aspiration; it is the specific intention to do this, as a designed-in and fully funded part of the HFC strategy. As a result, and far from leaving people in a ‘haves and have-nots’ scenario, the commitment is to undertake substantial new HFC construction work to fill in the ‘black spots’ in the original HFC rollout that occurred when those original rollouts ceased. The whole intention is to erase the inequities that Adam Turner has so eloquently framed (in his article) that exist within the current HFC environment. Some of the technical specifics of what the upgrade involves are listed in the report on page 90. The last part of the coaxial cable network is shared between you and your immediate neighbours. Despite claims to the contrary (including in Adam Turner’s article linked above), this use of shared segments in the last part of the network is also the case in the existing NBN fibre (FTTP) design. The FTTP network uses Passive Optical Network (PON) shared segments to deliver access in each local group of premises. The trick (in both technologies) is to keep the contention ratio acceptable in each of these shared segments. There is a commitment in the NBN HFC context to do that, just as in the FTTP rollout, so that the result is great for all users. So this really isn’t going to be like present-day HFC internet services, which deliver speeds of up to 100/2 and which do tend to slow down in busy periods. Instead, the rollout proposed can create an outcome that will be very similar to the FTTP network in terms of consumer outcomes, for speed, performance, and reliability. What about multiple-dwelling-units (MDUs) in the HFC rollout areas? Delivering services into multiple-dwelling unit (MDU) – including apartment buildings – is one specific example where its likely that the pragmatic solution will be the use of FTTB (fibre-to-the-basement). In this approach, optical fibre is brought into the building basement and the broadband services are then reticulated using existing in-building copper lines and vectored VDSL. Those copper lines are so short that these deployments should be quite capable of hitting 100 megabit speeds routinely, with a viable upgrade path using G.Fast to hit gigabit speeds in the future. I have already noted that my own home is in an HFC rollout area (in Adelaide). I am personally quite looking forward to the scenario in which the NBN turns up at my house, delivering me a 100 megabit broadband service via the cable box that is already on my wall right now, and turning off the copper line sitting just above it. This will get me a 100 megabit NBN service with a high upload speed, far sooner than I would otherwise get it, and at entirely comparable performance levels to the FTTP rollout areas. And at exactly the same retail price. I will also make it a personal mission to advocate that the performance (including upstream performance) of these services is up to scratch – and that it is comparable to the outcome in FTTP NBN areas. This matters hugely to me in general, and also (as I’ll be the recipient of one of these services in my own home) it also matters a great deal to me in particular! Disclaimer: This post (like everything on this site) is my personal point of view. It does not represent (or claim to represent) the formal position of NBNCo or its board. This entry was posted in broadband and tagged HFC, nbn, strategic review by simonhackett. Bookmark the permalink.